Gooney started his professional playing career in the City where he was born, Sheffield. Like many players before and after him was snapped by Sheffield United from local non-league outfit Norton Woodseats. It was whilst at Bramall Lane where he made the most of his 173 professional appearances during his football career. Prior to his signature he featured for the England Schoolboys on two occasions; at Under-15 level, he was captain of the national team which lost 3-2 in Edinburgh to Scotland and drew 2-2 against Wales in Swansea in 1925. He was educated at Newhall CM School and became a talented and promising young player; it was whilst he was there he was made captain for both Sheffield and England Schoolboys. As soon as he was of age to leave school he was signed by Sheffield United (on 15th June 1925) but his resignation was cancelled after he was found under age. Afraid that they may miss out of this young starlet he was given a job as an 'office boy' whilst he would train with the players. And until he turned seventeen, where he could sign a professional contact played at amateur level for Grimsthorpe Wesleyans and Norton Woodseats. Aged just 20, Gooney was one of a crop of young players (along with; Jack Smith, Harry Hooper and Tom Johnson) who were kept out by the old rearguard but showed enough skill and enthusiasm in his first season at the Lane to make a number of appearances. He made his Football League debut in a 2-2 draw at Leicester City in September 1930 and featured in 23 league fixtures out of a possible 42, finishing 15th in the league with Arsenal as champions. The following seasons campaign saw William make more appearances in a Red and White shirt; he failed to hold down a major role in the team but was able to net his first career goal in a 4-2 home victory over Chelsea in November 1931. United made a promising start to the season; and recorded great wins against Derby County (3-1) and West Ham United (6-0) but there fine run of four games unbeaten came to an end at Everton (lost 5-1) with Gooney present for the first quarter of the season. The Blades soon picked up the pace and for a short period were top of the league, exceeding expectations and finishing in a comfortable 7th place - the seasons end came on a sad note when the clubs' secretary John Nicholson was killed in a road accident on his way to Aston Villa on 23rd April 1932, the match still went ahead with Gooney wearing the number 4 shirt, Villa won the game 5-0. With Nicholson sadly losing his life the club drafted in Teddy Davison who had recently been a successful manager with Chesterfield, as a player he was a fine goalkeeper with England and Sheffield Wednesday. However he decided not to bring in new talent to Bramall Lane and as a result allowed Gooney to prosper in the team that he inherited. Gooney made 23 league appearances during the 1932-33 campaign and netted once in a 3-1 home win over Newcastle United; despite his lack of appearances the Sheffield born man became an influential player in their mid-table finish. Sheffield United had completed an unlikely double over Arsenal in the previous season but was humiliated in a 9-2 defeat at Highbury around Christmas time - Gooney absent from the team on this occasion but maybe the most bizarre fixture the club had seen to date was seen at Ewood Park in October 1932. They lost 3-0 to Blackburn Rovers in what can be only described as 'appalling conditions,' had the game took place today it's very likely it wouldn't have been started. Bitterly cold wind and driving rain swept Lancashire and later turned to snow. In the first half of the game Rovers had the advantage with the wind against their backs and flew into a 3-0 lead but play became unplayable with pools of water surrounding the pitch; making play farcical - three home players were forced to leave the game (the concept of substitutions didn't occur then), as was Patrick Carrigan for United before the referee stopped play to consult with his assistant. After five minutes of consolation, deciding what to do he took the team off the field for ten minutes with many players in a distressed condition in the dressing room; there were various suggestions as to what should happen and the Blades were asked how many could continue with play and reported seven whilst Rovers with a valuable lead boasted nine or ten. The game was further delayed by twenty-five minutes when the referee collapsed, no doubt through the weather conditions. However the game was re-started with the senior linesman in charge and only eight players for the visitors the game ended in almost complete darkness. Willam Gooney had featured in his fixture, but retired after 73 minutes due to the terrible whether conditions. In the first time in their elusive history the club were relegated, finishing bottom of Division One, the then equivalent to FA Premier League. 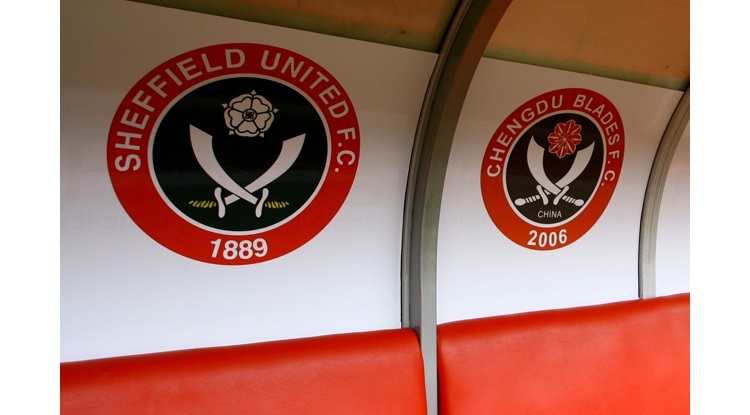 The Blades made a dire start to the season, recording heavy defeats against Leicester City (0-4), Sunderland (0-5), Middlesbrough (3-10) Derby County (1-5) and Chelsea (0-5), winning only twice In the first ten fixtures of the season (+ one drawn). They had a rare win at Sheffield Wednesday (Bert Williams with the goal) but injuries to George Green and William Gooney destabilised what was already a weak side; adding to this was the sale of Jimmy Dunne to eventual champions Arsenal - he left the club having netted 104 goals in the time Gooney was with the club. Peter Baines and Reg Spooner where both brought in from York City but the gulf in difference of coming up two Divisions proved too difficult as they netted just six goals between them all season, whilst defender Charlie Wilkinson, a £2,000 signing from Leeds United contacted influenza and didn't become a regular until early December. That victory against City rivals Wednesday proved to be the clubs' only win away from home and recorded the double when Bill Boyd netted a hat-tick in a 5-1 win. It was dark times for a club who had spent 41 years in the top flight and had been crowed champions just once in 1898; but for Gooney he was to make some achievement with the Blades, in the second tier of English football was handed the captaincy for Sheffield United. Harold Barton, a winger with plenty of skill was drafted in from Liverpool but poor results meant that a quick return to the football elite were all but a pipe dream. Gooney looked to have a bright future with the club after a couple years of uncertainty but never seemed to fulfil his early promise; he lacked strong constitution and eventually lost his place to Archie McPherson who took over the captain's armband. Poor results which constituted in a 7-2 loss at Fulham and an humiliating FA Cup exit at West Bromwich Albion (lost 7-1), but recoded great wins against; Bradford City (5-2), Bolton Wanderers (6-2), Newcastle United (5-1), Southend United (4-0), Southampton (6-1) and Bury (5-3). Nether the less inconsistency gave them a mid-table finish and at the end of the season Gooney moved away after five seasons with the Bramall Lane club. He was never really a strong player and his progress was dampened by three spells of pneumonia and had to wait until he was aged 20 before he made his first appearance for United; three years after he signed. He lacked strength and stamina but was capable of fine football; this may well be why he wasn't a season long regular for United. Unhappy at Lane life he asked for a transfer in 1933 which was turned down and despite being appointed as team captain in August 1934 subsequently resigned the following January and in June was sold to Plymouth Argyle in a £300 transfer. His time at Home Park wasn't the greatest either, making just fourteen appearances for the 'Green Army' before leaving for pastures new some seven months later. William, who was often referred to has 'Bill' during his short time in Devon made his debut in an home defeat to Bradford City (0-1) on 2 September, wearing the much familiar number 4 shirt - however whilst with Argyle he would often be placed in the number 6 position and in his final game be number five. He played in the 7-1 massacre of Barnsley and in the heavy 5-0 defeat at Newcastle United before making his final appearance at home to Port Vale in a 4-1 victory. It's unclear as to why he left, maybe it wasn't quite what he expected or the club were in some financial instability and were forced to leave him of his services. Gooney moved to Bedfordshire were he joined Luton Town, he came as a 'job' lot of four players whom all made the move from Home Park to Kenilworth Road in February 1936. Whilst at Luton Town he struggled to make headway into the Hatters team and had to wait until late March 1936 to make his first appearance, this came in a three-nil drumming at Swindon Town but would miss the win over Torquay and a draw against Aldershot before re-appearing for the 2-1 defeat at Torquay United wearing the number four shirt. He played in the back to back games on 10th and 11th of April in the draws against Bristol Rovers (2-2) and Millwall (0-0). He was injured in his final game for the Hatters and two days later they netted twelve goals without Gooney; he left the club at the end of that season. As for Town they failed to win promotion from the Football League Division Three (South), finishing just one point behind Champions Coventry City, where only one team was promoted. They did lead the way at one point with high scoring victories against Crystal Palace (6-0), Newport County (7-0) and Bristol Rovers (12-0) but a draw at Coventry soon after lost them the league title. His injury became too much and at the age of 25 retired from professional football, it was a sad time for Gooney having spent three years on the dole after leaving the beautiful game before taking up employment with the Sheffield Electricity Department, giving them 33 years experience. He retired to Blackpool where he passed way on 11th June 1978.